Phuket Property for Sale from Emerald property group of Patong Phuket Thailand. This is one of the best Propertys For sale in Phuket in the area of Patong. 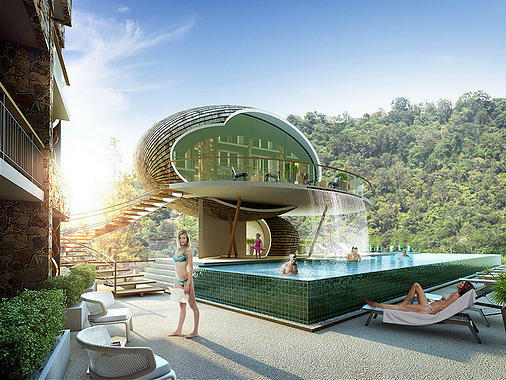 The project offers condo units for sale with great functional design with brilliant city, mountain, and Andaman Sea views and Phuket city only a few kms away. With it being of very high quality and built to exacting western standards, you can be comfortably assured that this will always be in high demand for both expats and tourists alike. Tri Tang Phuket This property is owned by a property group based in Thailand and looking for a quick sale. Currently 15 % under market value and has been reinstated after being a repossessed distressed property. Luxury Beachfront Villas on the upper level, paired with the One Pool Villas beneath looking out towards the breathtaking panoramic view of Tri Trang Beach.